Commonly know as the ‘mayor of Detroit’ House Shoes has done as much for the motor city’s Hip-Hop music scene as Berry Gordy did for it’s soul music scene. Responsible for J Dilla’s (then known as Jay Dee) & Danny Brown’s first releases he has championed his home city like none other and little wonder why. Now a recording artist in his own right he has made his own path through the music industry as a record shop owner, label boss, DJ and producer. A man with a unique vision and perspective on life that he is more than happy to share this is set to be another great party from The Doctor’s Orders. 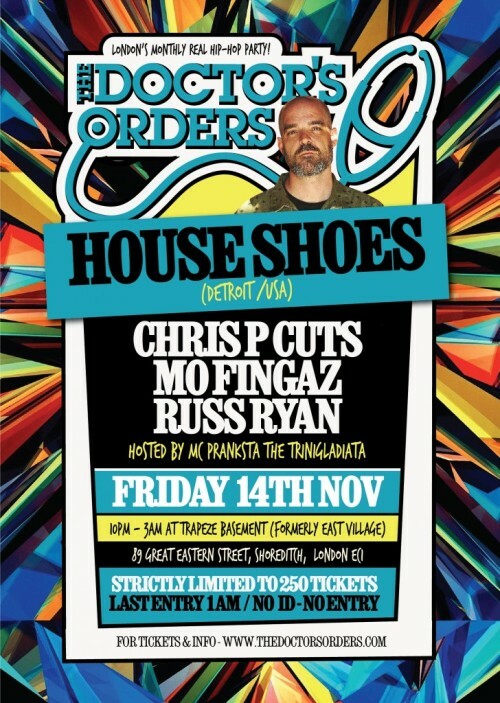 As ever our special guest is joined by a dream team of residents in the various shapes and sizes of Chris P Cuts, Mo Fingaz and Russ Ryan exploring Hip-Hop and beyond so keep your eyes and mind open!